The Exhibitors' Handbook® introduced a variety of new exhibit and display products including new banner stands, new illuminated displays, outdoor tents, billboards and much more. Browse the wide range of new products available below! The Orient Organic 850 is a high-quality, affordable retractable banner stand that features an aluminum base with a maple woodgrain color. The retractable graphic rolls into the base. The Orient Organic stand comes with plastic end caps, a hybrid bungee-telescopic pole, adjustable feet on the base and a padded carry bag. The Mosquito Arctic 850 is an affordable, basic banner stand that features a white, plastic base and white endcaps. This economy banner stand includes the base, retractable graphic, three-piece bungee pole and carry bag and is very simple to assemble. Dragon Fly is a double-sided roller banner stand with sturdy base and bungee pole. This banner stand is very compact and features a sleek silver base with swivel feet for stability. Graphic width measures 33.25", with graphic height measuring at 78.75". Merlin is a smart and stylish cassette banner. The graphics are easily replaced with its quick change cassette mechanism. This banner stand is great for any environment where your message needs to change regularly. The Formulate® Essential Banner 800 - Straight measures 31.5"W x 92"H and features a simple straight bungee-corded tube frame and a fabric graphic that simply slips over the frame. Perfect for any environment - from retail to trade show! The Formulate® Essential Banner 850 - Straight measures 33.5"W, 92"H and features a simple straight bungee-corded tube frame and a fabric graphic that simply slips over the frame. Perfect for any environment - from retail to trade show! The Formulate® Essential Banner 1000 - Straight measures 39.5"W, 92"H and features a simple straight bungee-corded tube frame and a fabric graphic that simply slips over the frame. 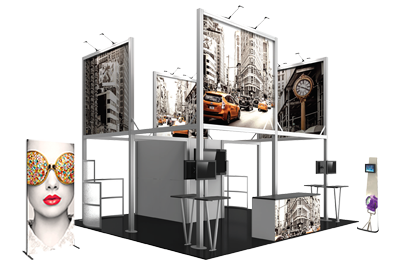 Perfect for any environment - from retail to trade show!